Turn your Family Trip into the Vacation of a Lifetime! Begin your Life Journey by exploring Heaven on Earth. Learn to ski from professionals or plan an All Women Tour with your Girl Gang. Experience Kashmir a bit differently. Looking at an All Inclusive Deal? These packages are just for you! For the ones who like to keep a low profile, with a little bit of everything. 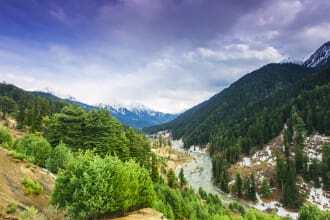 Short Getaways to the Kashmir Valley for the ones who are in the rush! Exploring Kashmir - What, Where & How? What clothes shall we pack? For the Winter Months (Dec-Feb) carry heavy woolens (jackets, sweaters, socks, gloves, cap, and inners) as Kashmir turns into a Snowy Paradise during this time. Make sure to cover up in layers to have a comfortable experience. For the Summer Months (May - August) carry light jackets, sweaters and socks. For the the rest of the months (March - April & September to November) carry jackets, sweaters, inners, socks, and wind-cheaters as it tends to get Windy around this time. What is the best time to travel to Kashmir? It entirely depends on the experience you are looking for - If you love Snow and would like to experience spine-chilling temperatures, then December to February is the best time to visit. 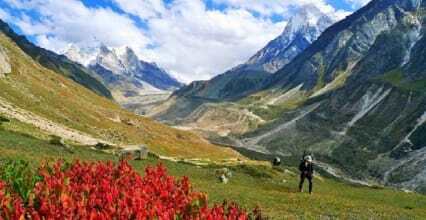 If you are tired of the Blazing Summers in your hometown, and would like to unwind at a pristine place, then March to June & September to October would be a great time to travel. Kashmir has a plethora of activities for Travelers. From Snow treks to skiing to cable cars, Kashmir has everything for all who set out to unravel the secrets of this mysterious land. What is the best way to travel to Kashmir? By Air - Srinagar (Sheikh Ul Alam International Airport), Jammu & Leh (Kushok Bakula Rimpochee Airport), all have an Aiport. Shortly, the Indian Government will also open the doors for the Kargil Airport to operate commercial flights. By Rail - The major railway stations are located at Jammu, Udhampur, Katra & Ramnagar. By Bus - Buses ply between Delhi - Jammu/Srinagar that take roughly 12 Hours. What is the popular food to try in Kashmir? Kashmiris love meat, so it is a heaven for Non-Vegetarians. But their affection for meat doesn't stop them from being good at Vegetarian Cuisine as well, since Kashmir Valley was formerly inhabited by Hindu Brahmins, who were pros at Vegetarian Dishes. Do try the Kashmiri Kahwa, which is basically a green tea, flavored with saffron, cinnamon and cardamom, garnished with almonds. It is a very body-warming drink prevalent all across the Valley. What kind of a weather awaits in Kashmir? 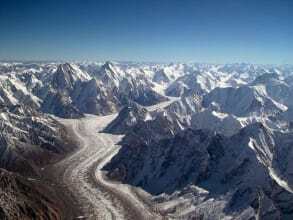 The Kashmir Valley is located amidst the Himalayas. Due to this proximity, the Valley experiences varied temperatures across the year. In the Winters, Kashmir is under a blanket of snow that reflects its Heavenly persona! Some rainfall is expected in the months of June to August, whereas in the Summer months of April to June, the sun can get a bit too intimidating, but the evenings are quite pleasant. 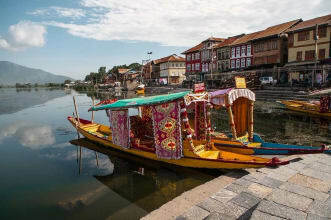 The Kashmiris can easily converse in Hindi, and since it is a huge attraction for tourists from across the World, many people also speak in English, except in the small villages spread about. How much handy cash should we keep with us? ATM's are easily available in the Valley, but as a back-up one carry around INR 10,000/- in case of any contingencies. Is Vegetarian / Jain Food available in Kashmir? Vegetarian and Jain food is easily available around the Valley, as there are a good number of pure vegetarians that throng to the state throughout the year. This Beautiful Mosque built in the 1700's, located in Srinagar is a Muslim meeting hall. Non-Muslims are not allowed to enter this Mosque, which was constructed without the use of nails. The interior and exterior of this Mosque is covered in papier-mache's, and colorful wood panelling also called as Khatamband. The Dal Lake, also known as 'Jewel in the crown of Kashmir' is the Second largest lake in the state. The shorline of the lake extends till about 15kms, and is outlined by Mughal era Gardens, Parks, Houseboatds and Hotels. This lake is the best place to experience the famous Shikara Rides of Kashmir. The Dal lake is also home to the floating gardens where Lotuses bloom between the months of July & August. The 15th Century brick Tomb was built in honour of King Zain-Al-Abdin's mother. King Zain-Ul-abidin was an incredibly peaceful ruler, and was fondly referred to as 'Badshah' or 'The Great King' by his people. The architecture of the Badshah Tomb represents the Shahmiri style of architecture, not seen anywhere else in India. The Nishat Bagh is the Second largest lake of the state, with a backdrop of the Pir-Panjal range. Nishat Bagh when translated from Urdu, means 'Garden of Joy'. The Bagh was originally built with 12 terraces, featuring gushing Fountains and flower beds. The Thajiwas Glacier is located approximately 3 kms from Sonamarg, and is easily accessible by foot or one can even hire a pony. This Temple located on the Shankaracharya Hill in Srinagar, is a Shiva Temple built with ancient grey stones, built in 200 BC. Earlier known as Takht-i-Sulaiman (Throne of Solomon), it is now named after a Saint who attained enlightenment here in 750AD. Located in Katra, Vaishno Devi shrine is the busiest Pilgrimage site in the country, located in the Trikuta Mountains. Its a 12Km uphill climb to visit this shrine, and carrying Baggage or Plastics is banned here. The journey to this shrine, is a depiction of the Journey taken by Mata Vaishno Devi where she observed various spiritual disciplines, that culminates at the Cave. One can also reach a certain point by a Helicopter from where its a short uphill hike. Porters are easily available here to ferry tourists up the Mountain.